I’ve been long fascinated by public art. I love the concept of making something that will hopefully be seen by the future generations, the ability to make something that compliments the environment in a playful way and that public art is free for everyone to see. One of my favorite pieces are by Amos Robinson. I love all of his works and hugely admire his talent. 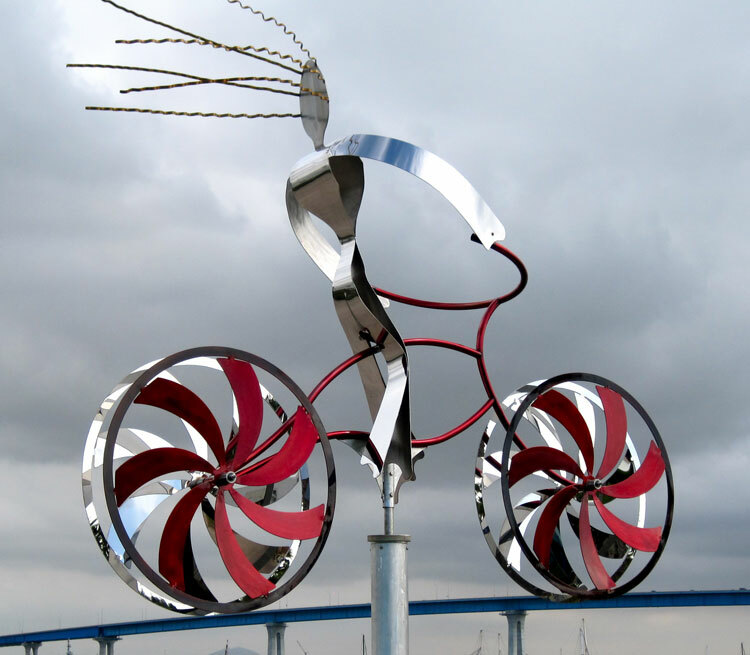 “My bike” is the first work of Amos’s that I came across and I fell in love with the idea and this kinetic sculpture. I love this carefree bicyclist that cruises on Tidelands Park, Coronado, CA. I can imagine him whistling a song, while he enjoys the sun and the breeze in his face and I love how the wheels spin with the wind. Amos’s skills with metal and mechanics come from a field unusual to an artist – he spent many years collecting and restoring old sports cars and motorcycles and his 30 year career in large-scale air pollution process equipment laid foundation for his artworks. The docent’s invitation was both a delight and a revelation. In that moment the world of art expanded to include more than objects hanging on walls or sitting on shelves gathering dust and admiration. That’s where it started for me as an artist. Bring the metal to life. Amos Robinson knows about the impact public art can have. A local metal sculptor—he is a featured artist at this year’s Mission Federal ArtWalk in Little Italy—Robinson was relaxing at home with his wife one Sunday when a woman visiting from Washington called. “She was down at the (San Diego) Embarcadero with her girlfriends, and they called just to say how much they appreciated my work there. It’s stuff like that that makes me a big fan of public art and what it can do,” Robinson says. 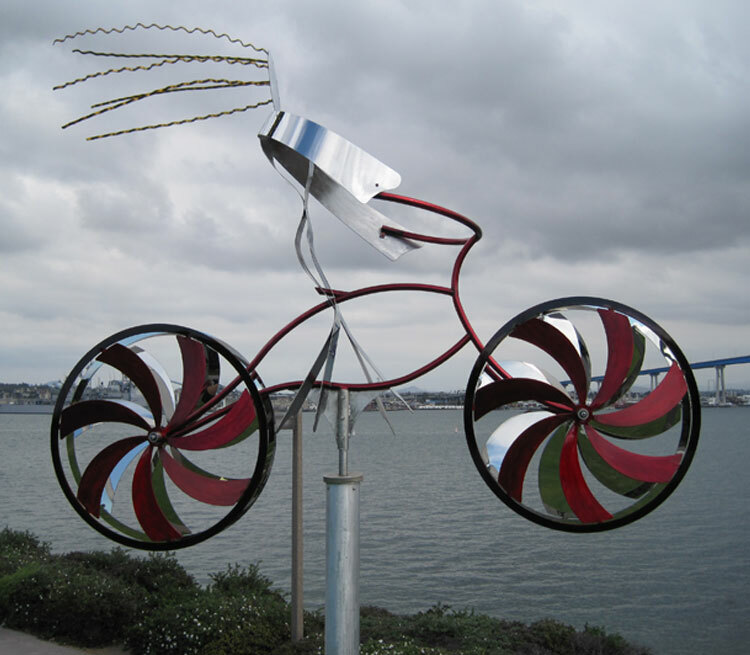 The women were viewing “My Bike,” which depicts a bicyclist in mid-air, strands of stainless steel hair flying back in the San Diego Bay breeze. 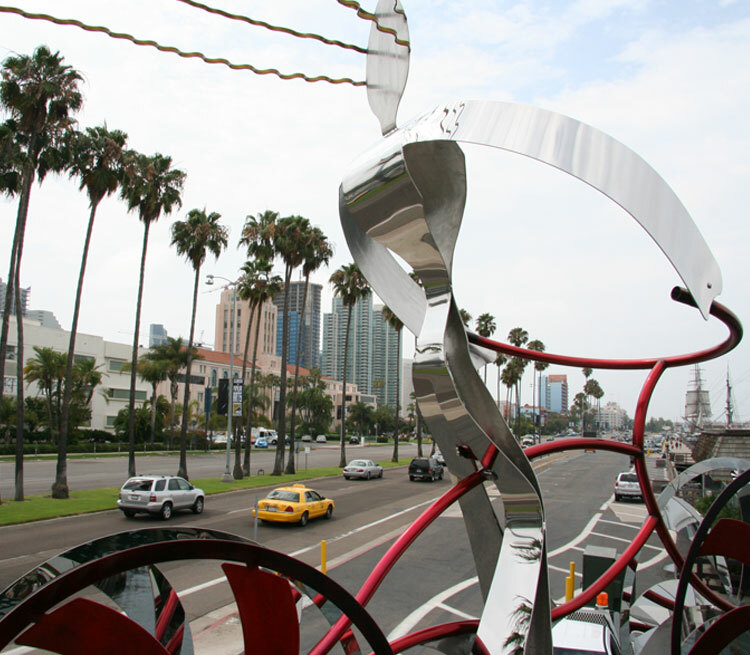 It’s one of five sculptures Robinson has created for the Port of San Diego’s rotating “Urban Trees” installation. Now in its seventh year, the annual exhibit includes 30 commissioned tree interpretations along Harbor Drive, from Hawthorn Street to the Cruise Ship Terminal. 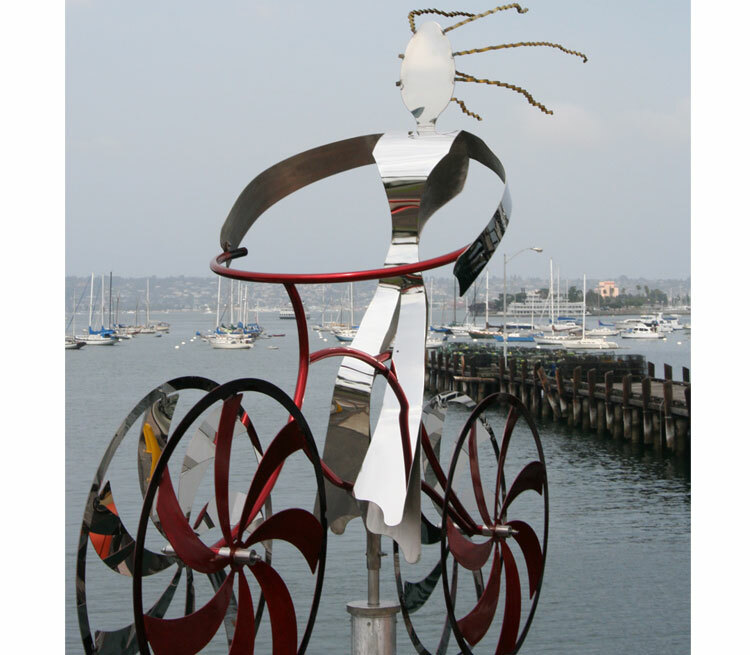 If you want to take a Public Art Walking Tour in Coronado, here’s the guide. Really genius, love how he incorporates the movie get wheel. Often street art is to one dimensional.